In the football combine, the best measure is not just the 40 yard dash, but the standing long jump and the vertical jump test. This is Part 3 of 8 Key Tips To A Better Vertical Jump. This article is guest blogged by Travis Hansen, author of The Speed Encyclopedia. 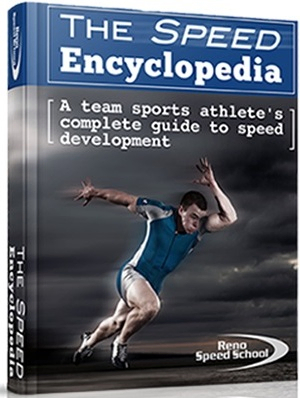 He also wrote Why Acceleration is More Important than Top Speed in Most Sports and Building Your Horsepower – The Power Development Model Part 1 and Part 2, which are full excerpts from his book. To read all his articles on this blog, click here. Below is the list, and I will detail each of them specifically in the sequence they are presented. The intuitive approach is to go out and jump everyday multiple times per day. There is a law of specificity that does indeed state that in order to make an improvement in a movement task you need to practice that task so your body can learn and master the skill. Unfortunately, too much of a good thing can be bad. Especially for advanced athletes who are so productive and waste so much systemic energy to achieve such high level performances. Here is a study that showed low frequency plyometric training was equally effective as moderate to high jump training frequencies. Why in the world would you do more for the same result you could get doing less? There was a very interesting study in 2008 that showed that low to moderate jumping training programs yielded the same outcomes in 20 meter sprint performance and vertical jump height versus a high frequency program that required athletes to perform 50% more volume of work. What would you do? It’s a no brainer, but the sad reality is that I see athletes performing programs where they jump 5-6x per week with volumes of 100-200 reps/foot contact per workout with no gains. Jump rope all you want but it’s not going to make you jump that much higher! My good friend Kelly Baggett and I have debated the concept of volume control with our plyometric programs for years. Kelly thinks the 50-75 foot contact per workout range is where it’s at, and I agree. I like the “sub-100” rule for high quality jump development so the proper neuromuscular adaptations can still take place and fatigue levels are still low. If landing’s become loud, coordination suffers, performance drops, and technical execution struggles then you should cease jumping, go recover, adapt, supercompensate/peak, and then come back to it days later. 2-3 days for beginner-intermediate athletes and 1-2 days of plyometric training for advanced athletes are optimal frequency recommendations to ensure speed and power skill are improved over the long-term. Several studies have indicated that static stretching does not improve vertical jump capacity. 10 14 15 16 This is why I have it last on this list. There was a study in 2012 that showed a slight increase in vertical jump height when “antagonistic stretching” was performed just prior to the jump. It makes perfect sense to me and I believe Joe Defranco really brought this concept to the mainstream for the rest of us. The glutes, hamstrings, and distal quads are the primary muscle groups in a vertical jump. All of these muscle groups extend and straighten the lower extremities at takeoff. The more net force these muscle groups can deliver the better we are going to accelerate vertically. However, if the antagonistic and opposing proximal hip flexors are not inhibited and remain tight and active then this will reduce the net force into the ground here is a short hypothetical numerical scenario that illustrates this function. You will see that the second breakdown yield more net force with relaxed and loose hip flexors. Glutes and hamstrings force=100 lbs. Hip flexors= – 40 lbs. Hip flexors= – 10 lbs. 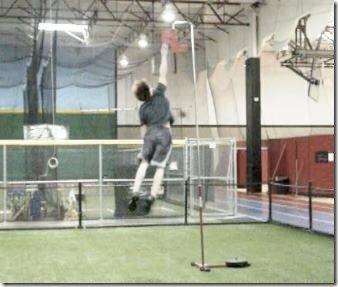 There are definitely some more sub-topics pertaining to vertical jump development that I decided to neglect in this article (nutrition, performance supplementation, lactic acid prevention strategies, warm-up, etc. ), but if you get a handle on all of these then you will be breaking some jump barriers sooner rather than later for sure! This is a running 44” vertical jump. I started at 39” and I was able to hit 46” at one point, and perform a full windmill dunk off of a bounce by following all of the info I provided you. In closing, I would just like to mention that a lot of the fancy vertical jump trends and gimmicks are exactly that. Things such as The Jumpshoe, vertimax, jump-roping, and calf-oriented schemes are not optimal or very effective, and I’ve tried them all at some time or another with myself or my athletes. None of these or others compared to what scientific and time honored performance training techniques can bring to the table and the results it can generate. Hopefully this taught you some new things you can add to your training toolbox, or helped dispel a myth, or just confirmed what you already knew and were doing.